Taiji Ball was created by Dr Pang in 2001 as a foundation gong for qigong, taiji and the martial arts. It uses spiral movements to work on the whole body. Bones, joints, ligaments and tendons are stretched and the qi channels opened. It increases flexibility and body-mind co-ordination. This DVD provides support with learning Taiji Ball, along with depth for more advanced practitioners. It is made up of six recordings. Learn Taiji Ball lasts 12 minutes and is intended for beginners. A further four clips allow newcomers to practise with Wei, first Outward Spiral filmed from the front, then from the back; then Inward Spiral filmed from the front and the back. Each clip lasts between three and five minutes. The last track, Practise Taiji Ball, lasts 12 minutes. In it Teacher Wei guides the practitioner into a deep entirety state that unites body, qi and mind. This greatly enhances both enjoyment and health benefits. Preceding the Taiji Ball recordings is ten minutes footage of Caterpillar Gong, complete with wall squats at the end. Both these strengthen inherent qi, the spine and the central nervous system. They are an excellent way to start one’s daily practice. 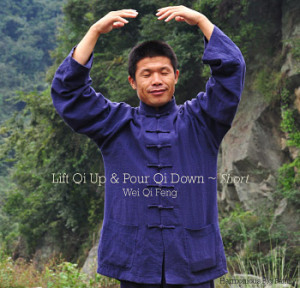 Lift Qi Up Pour Qi Down is easy to learn and brings rapid benefits. It draws healthy qi into the body to improve vitality and wellbeing. It can be practised at all levels of ability, including by people with limited mobility. The DVD contains two recordings. The 26 minute version contains detailed instructions of the movements and related mind activity. Footage taken from different angles shows movements clearly, with close-ups of specific postures. Practising to this DVD is easy for those new to the method. The 37 minute recording suits those more familiar with Lift Qi Up method. It highlights Teacher Wei’s abilities in leading practitioners to open themselves to pure healing qi, in a state of unity with the natural world. This deep connectedness enables transformation and healing, and brings a sense of peace and deep relaxation. 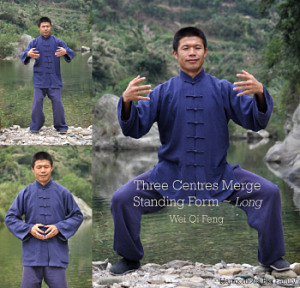 Standing Form is important at all levels of qigong practice. It quickly builds internal qi and spreads it throughout the body. It frees up the spine and strengthens the central nervous system. It develops a stable and peaceful mind, along with more robust health. Standing Form is a foundation gong for all the martial arts, as well as for qigong and taiji. The Zhineng Qigong posture is especially effective for improving qi flow and opening blockages. Two lengths of practice on this DVD provide choice. The 33 minute version suits beginners and those with less time for practice. The 50 minute version suits those wanting a deeper practice or who wish to resolve health problems. To ensure top quality sound and visuals, these DVDs were filmed in studio using one fixed and one moving camera. Lift Qi Up is a gentle moving meditation that can be practised by people of all levels of health and mobility. We practise this method to connect with universal qi and draw it in to nourish our body and mind. Mind activity is especially important in Lift Qi Up. 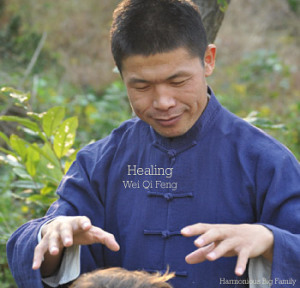 In this recording Teacher Wei leads deep meditative practice that relaxes and revitalises. The first recording is suitable for beginners, clearly describing both the physical movements and related mind activity. The second recording focusses more fully on mind activity and linking to the healing qi that fills our universe. Practice of Lift Qi Up improves the amount and the quality of qi in our body. This helps both to heal illness and to ward off disease. It connects us more closely to the natural world and to the transformative powers of pure original hunyuan qi. Our busy lives and life’s challenges can lead to stress or tension. It can be hard to put everything aside, to relax fully and completely. This recording was made to bring us to a state of peacefulness, inner harmony, stillness and utter relaxation. It is intended for anyone of any age and state of health who wishes to nourish and quieten their body, mind and spirit. Those who look for a more advanced and longer practice will revel in this version of Lift Qi Up. Teacher Wei guides us in a harmonious and peaceful practice where we feel deeply relaxed and rejuvenated. Lift Qi Up is based on traditional Chinese understanding of the oneness of all existence. Practising it helps us merge with the original universal qi (hunyuan qi) that is the basis of all things in our universe. Hunyuan qi can integrate and transform within our body to immensely improve our health and wellbeing. By doing a longer practice we can go deeper into the hunyuan entirety state and link ourselves more completely with the qi of the natural world and that of the universe itself. With our pathways to these opened more fully, the pleasure and the benefits extend ever further into our daily life. Enjoy the background of birdsong and the uplifting qi field of the Wudang Mountains when you join Teacher Wei in this practice. The Standing Form is a foundation practice in Zhineng Qigong. 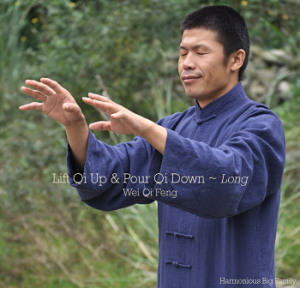 It suits all levels and stages of practice and is important for raising our qigong level. In order to truly benefit from it, we need to go into a deep qigong state and enjoy feeling we are one with the universe. This can be difficult if we have not learnt to still and focus our mind. Teacher Wei has an ability to help us reach this state, so that we can draw in original hunyuan qi to nourish and transform ourselves. 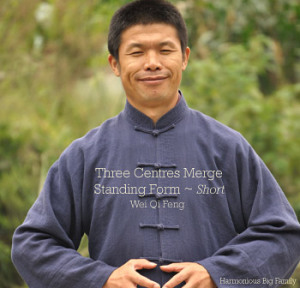 This shorter version of the Standing Form is not too physically demanding for beginners; the body is lowered for only half of the recording, following an introduction that draws listeners into the Great Harmony known to Chinese sages of old and to those who enter deep into their qigong practice. The hands are at duqi to cultivate lower dantian qi but could be raised by those whose energy is abundant (in this one follows one’s own feelings as to what is best). This longer variant of the Standing Form provides an interesting alternative to the better-known version, in both mind activity and posture. As shown on the cover, it allows for two variations in posture: the arms can hold a ball in front of the chest and/or the practitioner can assume the Great Horse Stance (Da Ma Bu). Damabu is very effective in mobilising inner qi and in activating and strengthening the shen or consciousness. The two-year class Teacher Wei attended always began their practice with 5-10 minutes of damabu, done very low with thighs parallel to the ground. When Teacher Wei subsequently led the Huaxia teachers in practice, he instituted one-hour damabu sessions. Then in 1998 Doctor Pang introduced the Eight Methods which include Gathering Qi Method (Ju Qi Fa), done in a higher damabu stance. Those new to damabu should begin with this stance, lowering their body only a little; over time one may feel a desire to lower the body more. Dr Pang taught the two-year class to do the Standing Form with their hands in front of the chest. Even beginners can practice this way if it feels good to them. If it feels difficult, practitioners will find it easier to keep the hands at duqi where they can more readily cultivate lower dantian qi. As energy levels build, the arms can be raised higher, though never above the shoulders. It is still possible to gather qi into lower dantian with the arms in front of the chest. The mind activity in this recording helps us to connect deeply with our body and to direct qi within it. Time seems to disappear as we follow the detailed instructions. Throughout there is a state of intense connection to the universe that distinguishes all of Teacher Wei’s practice. Qi flows through our body along channels (sometimes called meridians). Body Mind Form works on these channels so that qi flows smoothly and well through them. It also works on the muscles, tendons, sinews and bones to tonify and strengthen them. Along with its many health benefits, practice of Body Mind Form improves strength and flexibility. It also enhances mind power. Our body and mind should be united when doing this method. Teacher Wei’s introduction leads us to this state of unity so that we achieve maximum benefit and enjoyment from the practice. This recording is suitable both for those new to Body Mind Method and for more advanced practitioners. Invaluable for those needing to work intensively on their health, this version of Body Mind Form is also a wonderful resource for any practitioner wanting to be immersed in sustained practice. There is a major emphasis on the spine, in particular the sections of Bow Body, Turning Weilu (the coccyx) and Crane Head Dragon Head. An open spine is vital for our health and Teacher Wei focuses on opening the lumbar vertebrae so as to adjust the central nervous system (and thereby the whole body functions) and on opening dumai (the channel running up the spine). The three sections above are often recommended to students from early in their practice, as they are especially helpful for many health conditions. Whatever the areas one chooses to focus on, the CD is set up as a series of tracks that can be played individually or as varied sequences. This flexibility makes it valuable for practitioners at all levels of practice. Insights and suggestions throughout this practice teach how to use our mind and body to achieve a deep experience and gain maximum benefits. These effective techniques can then be applied in our other qigong practice. To improve health and cure illness, Zhineng Qigong teachers often lead their students in a healing practice. The listener follows the teacher’s instructions in a focus on bringing healing qi and information to different parts of their body. Covering the whole body from head to toe, the healing also links to different organs and functions. The whole body is revitalised and imbalances are corrected. All benefit from this practice, whatever their state of health. Those who are not well enough to take part in more physical methods will especially welcome this detailed healing recording. By following Teacher Wei’s soothing instructions it’s possible to rejuvenate our body and bring a sense of wellbeing. Doing healing practice can also reduce or eliminate pain and strengthen the immune system. Wei Laoshi also wishes to remind people that important elements in healing any problem are to always maintain positive and stable emotions, and to strengthen our kidney qi. Qigong Centres in China make Pulling Qi part of the daily routine, often lasting an hour or more. The movement is simple and easy to learn; mind activity is key to this method. It is hugely valuable for those who have limited movement. While it is usually done seated, it can equally be done standing or lying. When we do Pulling Qi our mind links out to original hunyuan qi and then in to the depths of our own body. The steady rhythm of our mind activity is one with the open and close of our body and the movement of qi out and in. Pure universal qi can suffuse our body and transform it. Throughout this recording Teacher Wei guides and teaches us so we gain maximum benefits from our practice. We can then use that knowledge ourselves, doing whatever length of practice time allows to enhance our health and wellbeing. From this practice we can also understand how to use qi to help others. 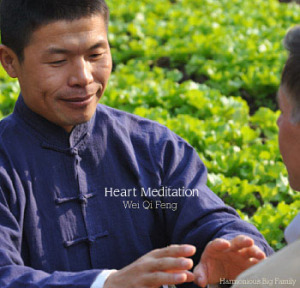 Teacher Wei has tailored this meditation recording especially for people with heart problems. In addition, practitioners should practice Pulling Qi, Stretching Qi (Chen Qi), sections 2 & 3 of Body Mind Method (see the long version of Body Mind Form above) and rotating the shoulders. The shoulder rotations should be as big as possible, to massage the heart qi and blood. Teacher Wei adds that happiness is especially important for the heart, keeping the emotions stable and positive. In qigong terms, when we laugh the heart hormones “come out” and change the heart energy. He says this means that every day we should smile and focus on the positive, to nourish and strengthen our heart. Pulling Qi should be done with the mind opening from and closing to the centre of the heart. When we do Pulling Qi our mind links out to original hunyuan qi and then in to the depths of our own body. The steady rhythm of our mind activity is one with the open and close of our body and the movement of qi out and in; pure universe qi can suffuse our body. Throughout this recording Teacher Wei guides and teaches us so we gain maximum benefits from our practice. We can then use that knowledge to enhance our health and wellbeing. Teacher Wei wished to record a practice specifically for people with cancer. He has provided the following information for those using it. “This recording sends positive, powerful information for you to connect to. You should simply follow my instructions without thinking about illness. “It is important not to worry, nor to think about your suffering. Instead, maintain good emotions in your daily life; don’t think of yourself too much; turn your focus to others, with a loving heart, positive thoughts and a helping hand where possible. This recording was made to help diabetics who are prepared to put in an effort to improve their health. 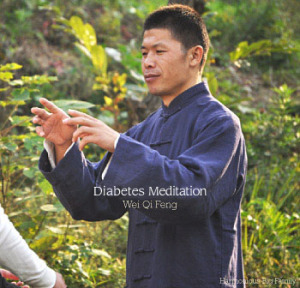 With diabetes, Traditional Chinese Medicine focusses on strengthening the functions of the kidneys, pancreas and liver. This happens through qigong practice, through dietary changes and through stability of the emotions. Diabetics should walk a lot and eat more vegetables and less sugar. This recording includes the methods of Pulling Qi using close (he) and open (kai) and of roufu. When doing roufu, the hands circle on the body and the mind is focussed inside while following Teacher Wei’s instructions. Its practice builds both kidney qi and middle body qi, including qi of the digestive system. Getting a good night’s sleep is a problem for many people. This recording by Teacher Wei can lead the listener into a deep and rejuvenating sleep and help break patterns of wakefulness. His soothing voice is profoundly relaxing and the unspoken information he incorporates is equally effective. The natural qi field of the Wudang Mountains increases the sense of peace and quietude. The latter section of the Sleep Well recording leads a practice of roufu, a simple exercise that can be continued for as long as one wishes. However, practitioners will find that it is very difficult to remain awake when doing roufu – it draws qi into a harmonised and inactive state that naturally leads to sleep. 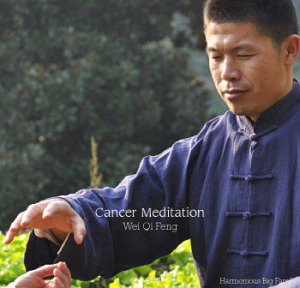 Pulling Qi can also be helpful to quiet the mind and aid sleep, so is included on this CD. It can be practised in bed using mind activity only.